The transition to kindergarten is tough for a lot of kids, but for those with developmental delays and disabilities, it can be especially challenging. Tristan Davis, who was diagnosed with autism spectrum disorder through Early Intervention (EI) services offered by the Clackamas Educational Service District, was primarily non-verbal when he began preschool at Sunset Primary’s Early Childhood Special Education (ECSE) classroom. His mom Tracey described preschool-aged Tristan as a happy boy who struggled with regulation and anxiety. Looking back, Tracey says she was nervous as Tristan began preparing for the transition to kindergarten as his ECSE preschool class met for only two and half hours each day, a few days a week. She compared that to the experience of her older son, Anthony, who attended a traditional preschool program for five hours a day, 3–4 days a week. Tracey, who later became a special education paraeducator, is frank about the reality of EI/ECSE services given current funding levels, including the impact that pay and other workforce issues have on the special education field. Tracey’s recollection of the stretched resources in her son’s classroom echoes reports from Children’s Institute and others that shows most children in EI/ECSE programs are not being served at recommended levels. 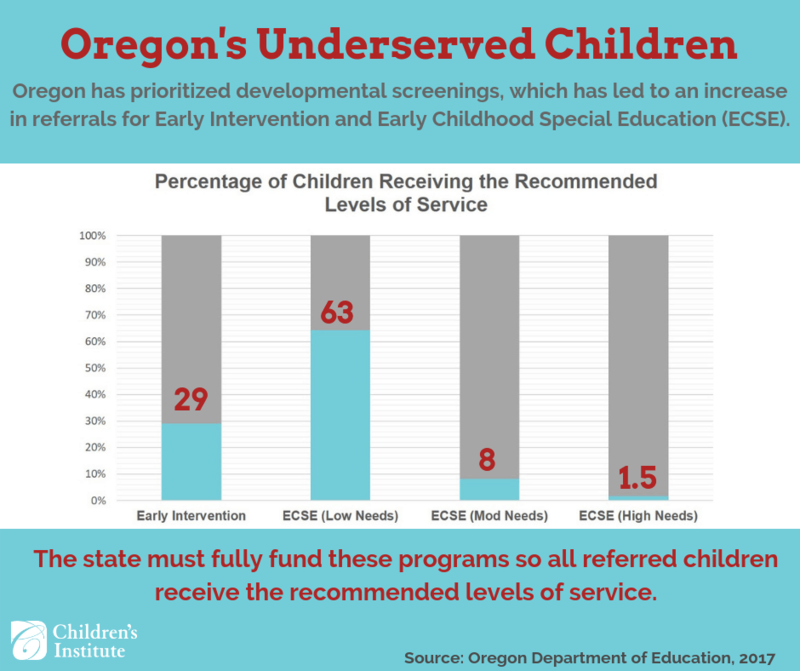 According to state data, only 28 percent of children enrolled in EI programming receive the recommended level of service. 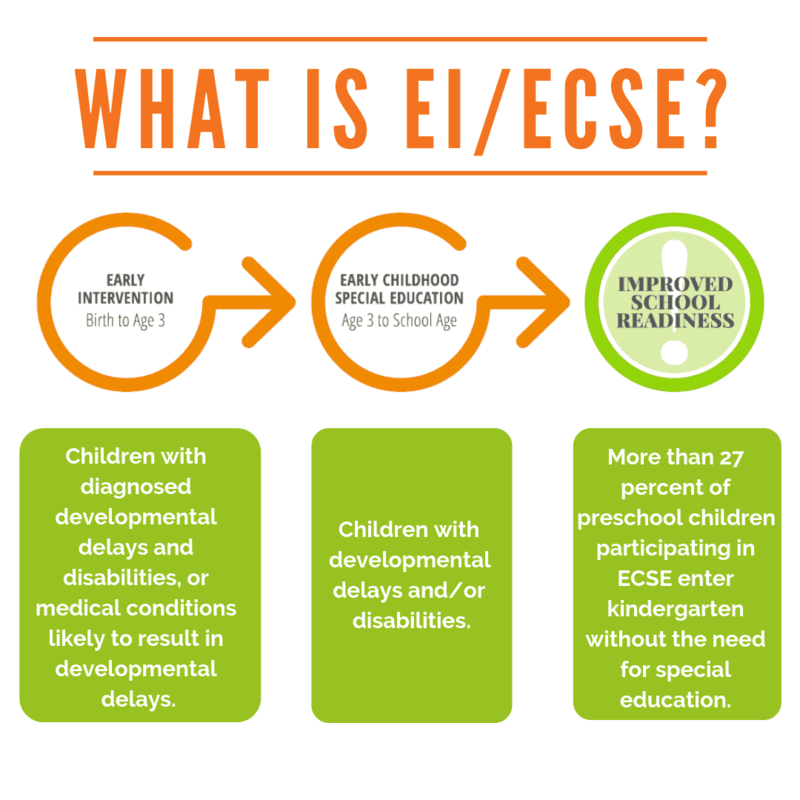 On average, children enrolled in ECSE with high needs only receive 8.7 hours of preschool per week, rather than the recommended 15 hours per week. EI service levels have actually decreased by an average of 70 percent from 2004 to 2016. The governor’s latest budget proposal devotes $45.6 million to EI/ECSE, about $30 million less than what the Early Childhood Coalition and the Alliance for Early Intervention says is needed to adequately serve children. In the 2014–15 school year, more than 21 percent of children exiting EI had caught up with their peers and did not require ECSE services, saving the state nearly $4 million annually. Those who work in the field see the need firsthand. Carla Moody Starr, a speech language pathologist on the EI/ECSE evaluation team at the Northwest Regional Educational Service District, says EI/ECSE evaluation staff are often the first point of contact for families who may be overwhelmed, in shock, or in a state of grief if their child is significantly delayed. Despite insufficient funding for EI/ECSE services, Tracey has high praise for the West Linn-Wilsonville school district’s ability to provide a wide array of resources to support her son’s learning and development. In advance of his kindergarten school year, Tracey met with the staff at Trillium Creek Primary School to map out an Individualized Education Plan (IEP). “Before school started, his kindergarten teacher left Tristan this long [voicemail] message saying, ‘I know you can’t talk to me, but I want you to know I’m so excited to see you.’ It meant so much to him and so much to me. West-Linn Wilsonville is considered a full-inclusion district, meaning both neurotypical children and children with special education needs are taught in the same classroom. While the Oregon Department of Education sets a state target of 73 percent of special education students being served in a general education classroom, West-Linn Wilsonville far exceeds that standard, reporting that 85.7 percent of its special education students are served in that setting. Ginny Scelza is a parent of two children who attended the Multnomah Early Childhood Program (MECP), operated by the David Douglas School District. The program runs preschool classes at 11 locations across six school districts and offers an inclusive environment where children with special education needs learn alongside typically developing children. Ginny, whose son and daughter are typically developing admits that her interest in the program was due to the affordable cost and convenient location, initially just a few minutes from her home. MECP tuition costs $32 a month for a twice-a-week program, much less than private preschool programs in the area. Free and reduced tuition is available for qualifying families. Ginny also valued the program’s emphasis on social emotional development. Ginny credits the program for creating a smooth transition to kindergarten for both her children. She also notes that the benefits of such programs have a positive effect that goes beyond just those children who have disabilities and delays. Join us and a growing coalition of Early Childhood advocates in requesting an addition $75 million investment to increase service levels for children with disabilities and delays.